Maurice Denis (1870–1943), The Ladder in the Foliage (1892), media and dimensions not known, Musée départemental Maurice Denis, Saint-Germain-en-Laye, France. Wikimedia Commons. Denis started on the road to realise his hopes when he gained entry to the Lycée Condorcet in Paris, presumably on a scholarship, and there he became friends with Édouard Vuillard and Ker-Xavier Roussel. He then moved to the Académie Julian in 1888, to prepare himself for entrance exams to the École des Beaux-Arts. He was successful in those later that year, and studied under Jules Joseph Lefebvre. 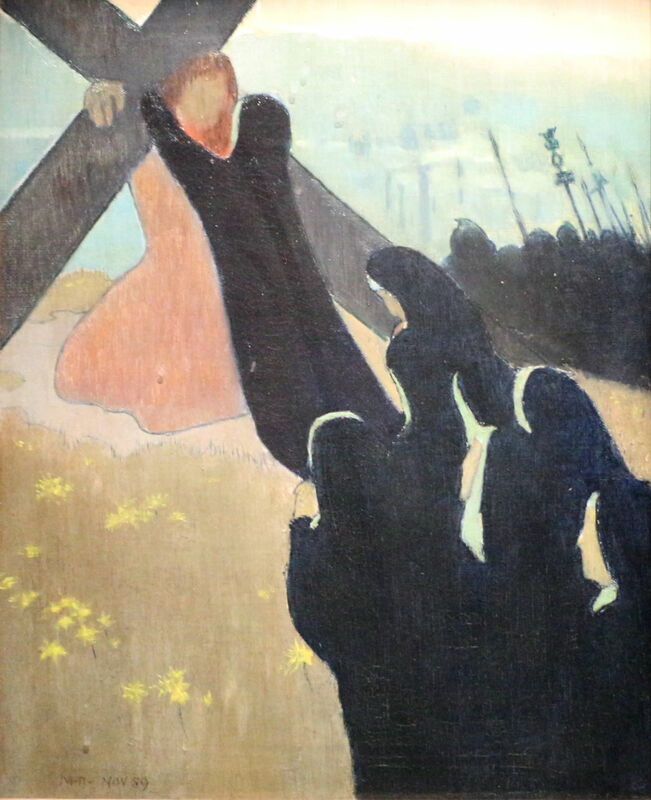 Maurice Denis (1870–1943), Ascent to Calvary (1889), media and dimensions not known, Musée d’Orsay, Paris. Image by Sailko, via Wikimedia Commons. In 1889, Denis came under the influence of Gauguin, and painted this Ascent to Calvary with the resulting simplicity and emphasis on design and form. Henry Lerolle, the industrialist and artist, was Denis’ first patron, and purchased Le mystère catholique (1889) for his collection. Later, Denis admitted that it was Lerolle who enabled him to pursue his career in art. By about 1890, Denis, Vuillard, Roussel, Bonnard and others had formed Les Nabis. With his baccalaurate in philosophy, Denis was involved in developing the group’s philosophy. He later summarised it as moving away from the idea that art is a visual sensation like a photograph, but that it is a creation of the spirit “for which nature is only the occasion”. 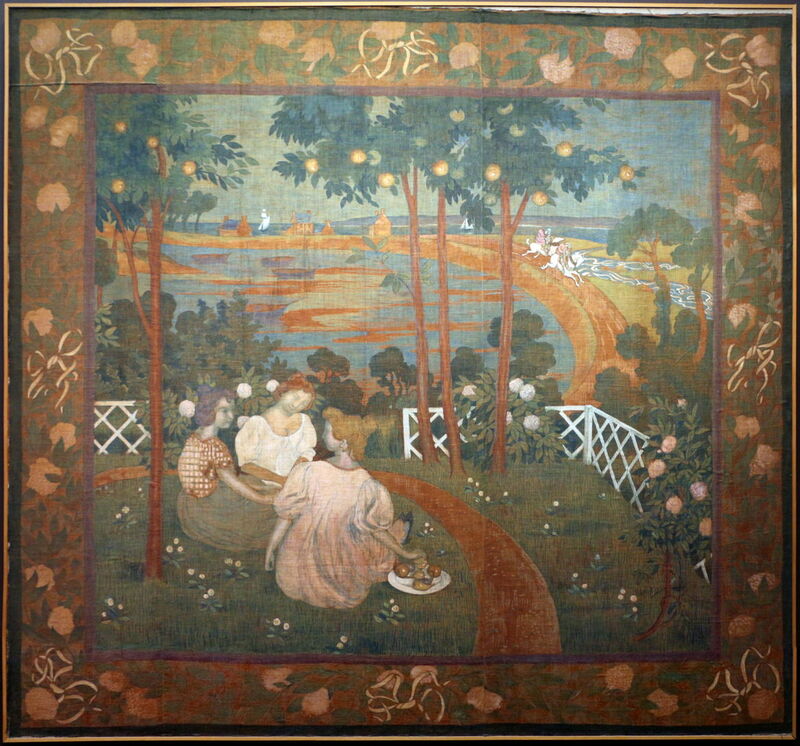 Maurice Denis (1870–1943), Motif Romanesque (1890), oil on canvas, dimensions not known, Los Angeles County Museum of Art, Los Angeles, CA. Wikimedia Commons. Denis’ style, as seen in his Motif Romanesque from 1890, was evolving to that of a Nabi, with muted colour, and his distinctive impression of softness in focus, even where he has painted the outlines of tree trunks in contrasting colour. In October 1890, Denis met Marthe Meurier for the first time; they became romantically involved the following year, eventually marrying in the summer of 1893. 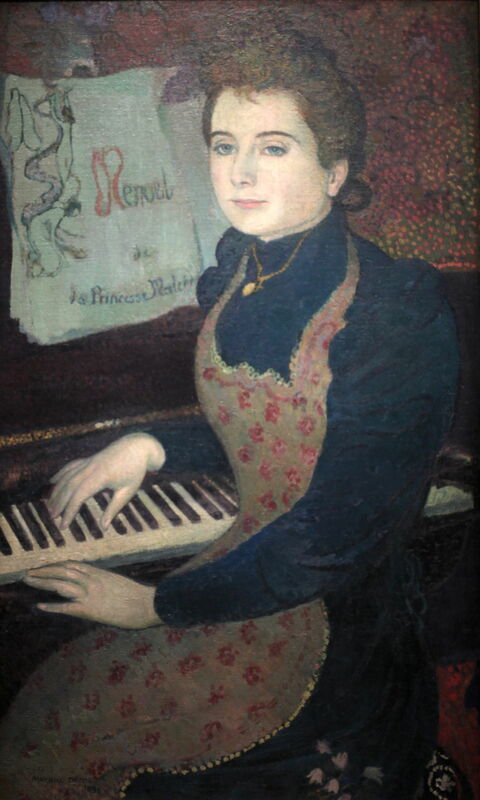 Maurice Denis (1870–1943), Marthe Playing the Piano (1891), oil on canvas, dimensions not known, Musée d’Orsay, Paris. Image by Rama, via Wikimedia Commons. Marthe was a pianist and musician, and she influenced Denis to look at the relationship between visual art and music. She was also the model for many of his paintings, starting with this, of Marthe Playing the Piano, in 1891. Although the music declares itself to be a minuet, her hands are posed over the keys rather than playing in earnest. 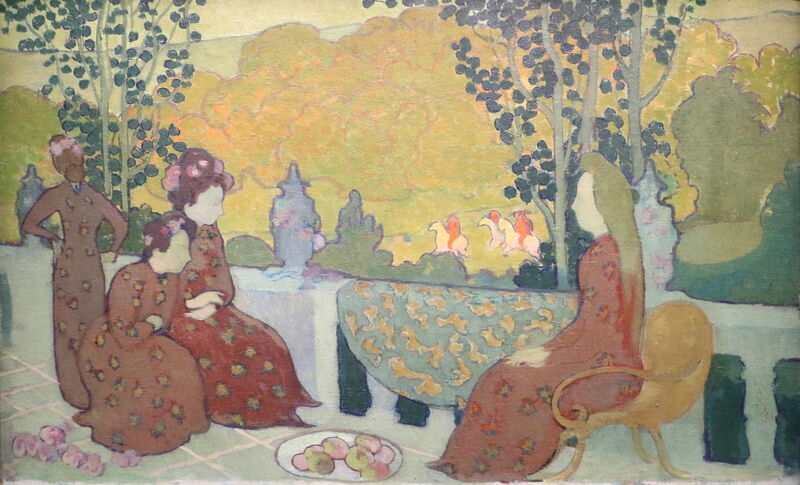 Maurice Denis (1870–1943), September Evening (Women Sitting on the Terrace) (1891), media and dimensions not known, Musée d’Orsay, Paris. Image by Sailko, via Wikimedia Commons. One of his first mature Nabi paintings is September Evening or Women Sitting on the Terrace from 1891. The forms of the figures are flattened, and each wears a patterned dress. There is obvious influence of Japonisme, and muted colours throughout. The following year, Denis painted four women climbing The Ladder in the Foliage (1892). The motif was popular at the time, typically showing young women picking fruit in fine weather. Gone are the patterned dresses, replaced by flowing curves more typical of art nouveau illustrations. There are no fruit either, and the poses of these women suggest a more spiritual purpose in their ascent. Maurice Denis (1870–1943), Green Trees, The Beeches of Kerduel (1893), media and dimensions not known, Musée d’Orsay, Paris. Wikimedia Commons. 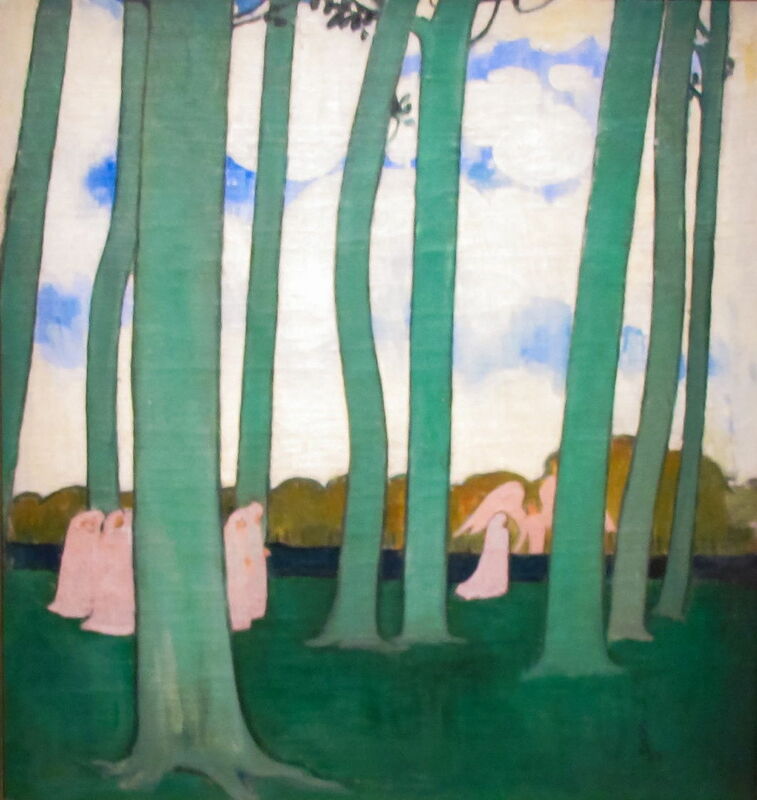 Green Trees, The Beeches of Kerduel from 1893 returns to his initial simplicity, as a small group of nuns in white habits queue to kneel and pray in front of an angel with wings. This is near a twelth century château in Brittany, which is one of many sites claimed to have been used by King Arthur and the Knights of the Round Table. 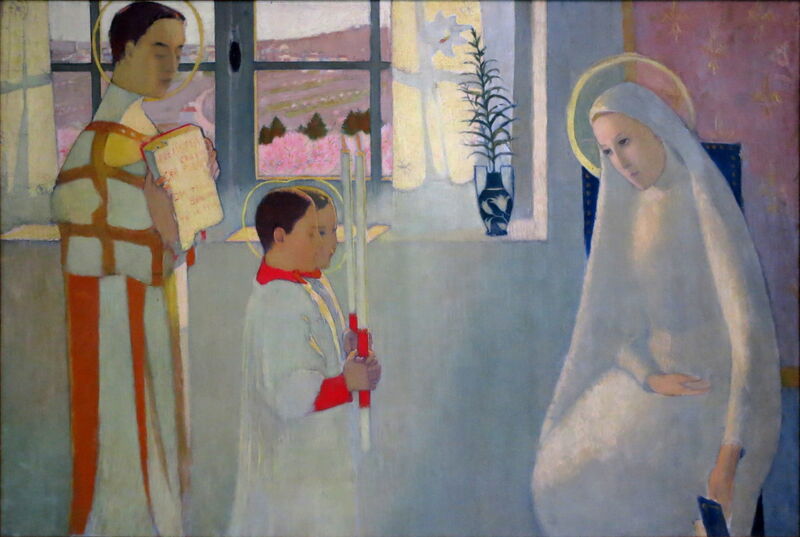 Maurice Denis (1870–1943), Nativity (1894), oil on canvas, 95 x 89 cm, Musée des Augustins de Toulouse, Toulouse, France. Wikimedia Commons. Denis was one of the artists who transcribed events described in the Bible into modern settings. 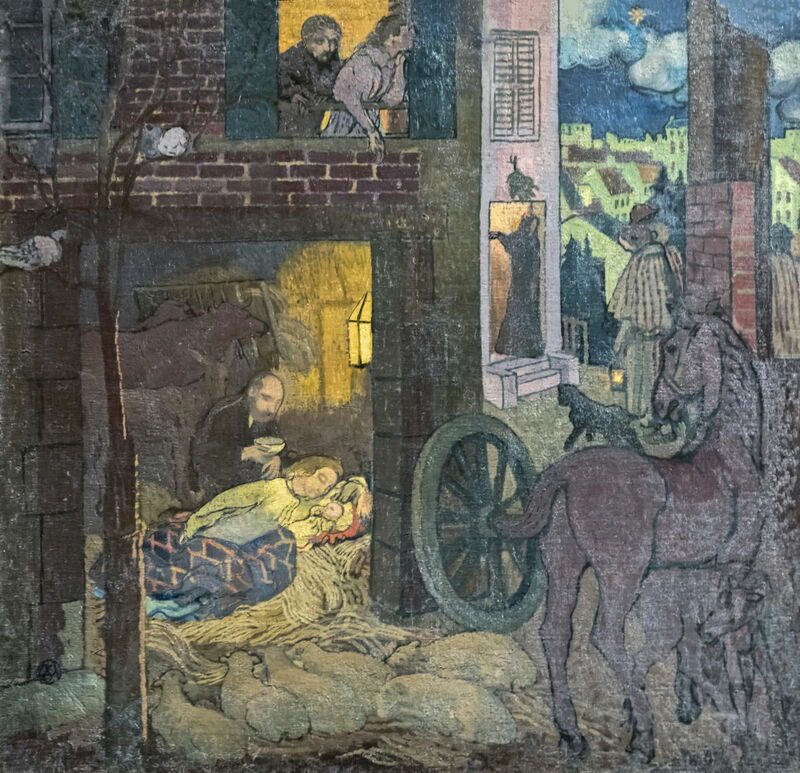 One of the most impressive of these is his thoroughly modern Nativity from 1894, in which the birth of Jesus takes place in a French town. During the early 1890s, Les Nabis slowly dissolved, but Denis maintained his close friendships with Bonnard, Vuillard and Roussel, with whom he later shared some major commissions. From 1895-97, Denis was occupied painting a narrative series telling The Legend of Saint Hubert, for the office of Baron Cochin. Sadly, images of these aren’t of suitable quality to include here. During this time, he started a long relationship with Paul Cézanne, visiting the older painter in Aix, and writing articles about his art. 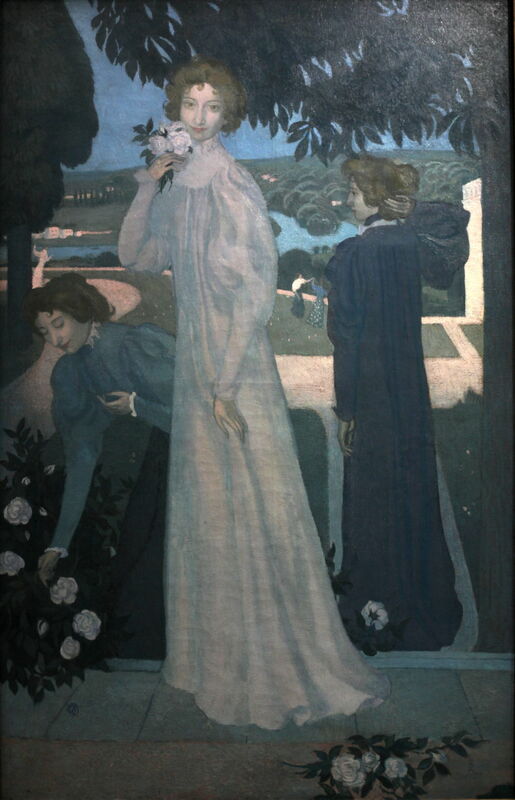 Maurice Denis (1870–1943), Portrait of Yvonne Lerolle in Three Views (one of three) (1897), oil on canvas, dimensions not known, Musée d’Orsay, Paris. Image by Rama, via Wikimedia Commons. In 1897, presumably commissioned by Henry Lerolle, Denis painted Lerolle’s daughter in this Portrait of Yvonne Lerolle in Three Views. Although relatively unusual, including multiple views of the same figure in a portrait has a track record going back to the Renaissance. Yvonne was also painted by Renoir, and was a close friend of Julie Manet, daughter of the late Berthe Morisot. 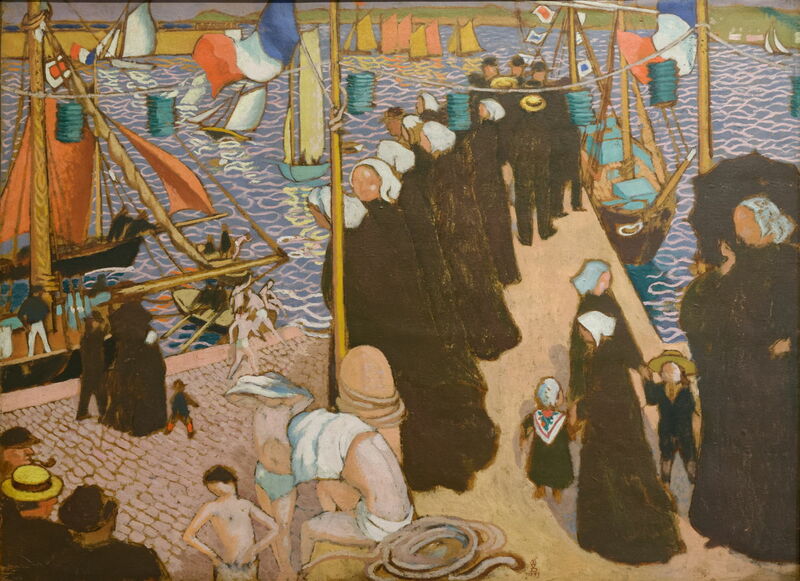 Maurice Denis (1870–1943), The Regatta in Perros-Guirec, View of the West Pier (1897), oil over wood panel on marouflé paperboard, dimensions not known, Musée départemental Maurice Denis, Saint-Germain-en-Laye, France. Image © Marie-Lan Nguyen / CC-BY 4.0, via Wikimedia Commons. During the late 1890s, Denis seems to have visited Brittany, perhaps during the summer. In 1897, when on the Channel coast of Brittany, he painted The Regatta in Perros-Guirec, View of the West Pier. His style here is strongly influenced by Gauguin, and his colours are starting to become higher in chroma. In 1898, Denis visited Rome for the first time, and studied the works of Raphael and Michelangelo in the Vatican in particular. 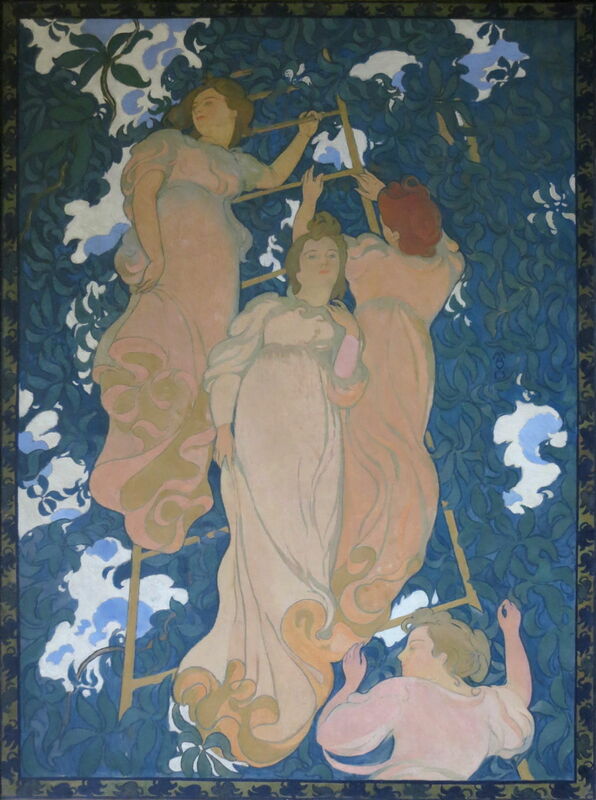 Maurice Denis (1870–1943), Cavalry Legend, or Three Young Princesses (model for tapestry) (1898), media and dimensions not known, Musée d’Orsay, Paris. Image by Sailko, via Wikimedia Commons. Denis became more interested in decorative arts, and in 1898 made this design model for a tapestry showing a Cavalry Legend, or Three Young Princesses. Maurice Denis (1870–1943), Homage to Cézanne (1900), oil on canvas, dimensions not known, Musée d’Orsay, Paris. Wikimedia Commons. It’s sometimes claimed that Denis’ major group portrait Homage to Cézanne, painted in 1900, was intended as a mark of respect on Cézanne’s death. As the latter artist didn’t die until 1906, Denis would have required a great deal of prescience for that to be the case. As if a manifesto for his generation of artists, Denis brought his friends together in his dealer Ambroise Vollard’s shop, around Cézanne’s painting Fruit Bowl, Glass and Apples. 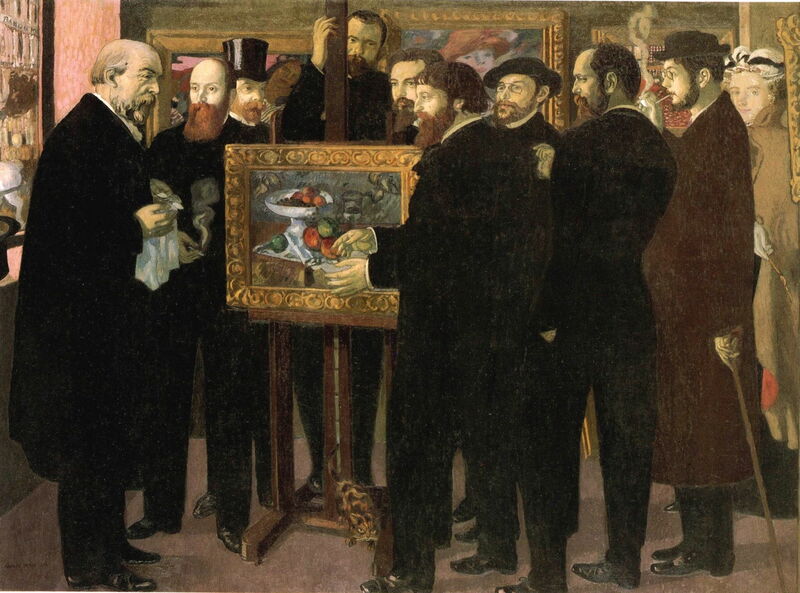 From the left, those shown are: Odilon Redon, Édouard Vuillard, André Mellerio (a critic), Ambroise Vollard (dealer), Maurice Denis, Paul Sérusier, Paul Ranson, Ker-Xavier Roussel, Pierre Bonnard and the artist’s wife, Marthe Denis. In the background are works by Gauguin (who owned the Cézanne) and Renoir. This is a homage in the form of those painted by Henri Fantin-Latour, who died in 1904. 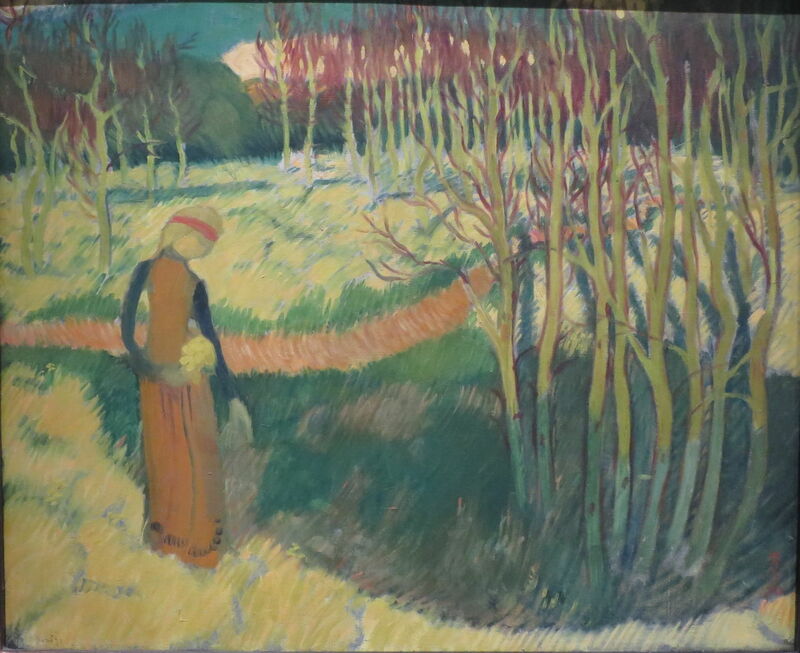 Denis exhibited this work in Paris and Brussels in 1901, although response to it was unfortunately mixed. Although Denis was asked to sell it, he refused, and finally gave it to the Musée du Luxembourg in 1928. 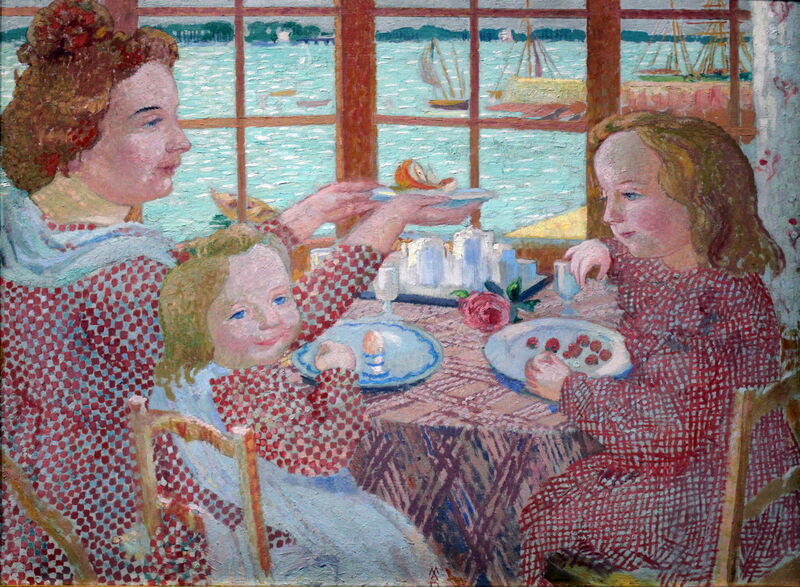 Maurice Denis (1870–1943), Breakfast (1901), media and dimensions not known, Städelsches Kunstinstitut und Städtische Galerie, Frankfurt, Germany. Wikimedia Commons. As the chroma continued to rise in Denis’ paintings, he experimented with Nabi-like dense patterning in Breakfast from 1901. So interesting, the softness, the patterns. The one with all the artists was fascinating too. Redon is one of my favorites. Denis’s painting reminded me of his.